I was at the State of the Union tonight. You cannot help but love the pomp and circumstance of the event, even if you do not agree with everything the President says. In this case, his opening lines on what we can learn from America’s “generation of heroes,” the next greatest generation, were particularly moving to hear in person as was the closing which returned to that theme with “Each time I look at that flag, I’m reminded that our destiny is stitched together like those fifty stars and those thirteen stripes.”But in between there was much to disagree with, especially from an economic policy perspective as I describe in tomorrow’s Wall Street Journal piece which I excerpted from First Principles. 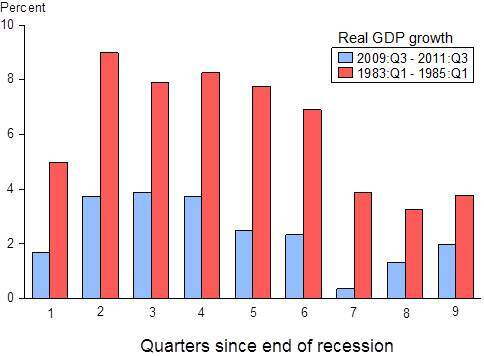 For one thing it is a stretch to say that “The state of our Union is getting stronger.” We are not really recovering from the recession, at least not compared to the period after previous big recessions such as the early 1980s as this graph makes clear. The reason is pretty clear. In the Wall Street Journal piece I refer to and quote from a memo written by President Reagan’s economic adviser George Shultz and others after the 1980 election. It laid out the long run economic strategy they recommended and which Reagan followed. Contrast that with the memo Larry Summers sent to President-elect Obama after the 2008 election, which is making the internet rounds. It laid out the short-run Keynesian policy Summers recommended and which Obama has followed. The big policy differences largely explain the big economic performance differences.